RPB HealTec project has received funding from the European Union’s Seventh Framework Programme for research, technological development and demonstration under grant agreement no 606645. The European Road Network is undoubtedly one of the most important land infrastructures in the EU. It is and will remain for the foreseeable future a crucial artery for Europe, both in economic terms, as it services the vast majority of goods traffic, and in social terms, as it does so for passenger travel as well. Maintenance is considered to be the most expensive function of a high-way operating agency, so there is a special need for the early detection of deterioration mechanisms and of potential presence of defects through a more advanced road pavements inspection technology. The RPB HealTec project system will detect the presence of defects, determine the cause, extent and rate of deterioration, provide information for assessing stability and serviceability and for evaluating the cost-effectiveness of various remedial measures and provide this information in real time, not causing traffic disturbances. The system is aiming to upgrade and optimize the inspection & maintenance of the European roads, reducing costs and increasing traffic safety and will achieve this by developing a novel automated and integrated NDT (Non Destructive Techniques) system for high speed analysis and evaluation. It will demonstrate the value of combining 3 technologies: Ground Penetrating Radiography, InfraRed Thermography and Air Coupled Ultrasonic testing with Near Real-Time data transfer and analysis as a reliable, fast and safe tool for pavement inspections, as well as a great business opportunity for SME participants in EU. The project system incorporates and drastically enhances the capacities of the 3 different techniques, to produce quantitative, reliable, precise, continuous and at-traffic-speed measurements. 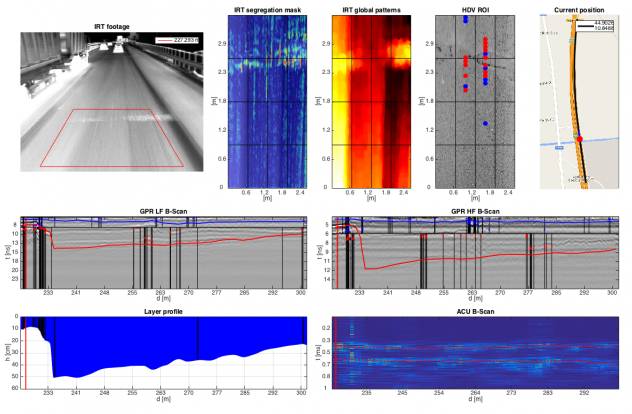 Research & innovation outcomes will be to obtain a GPR capable of detecting adjacent layers of the same materials at traffic speed, quantitative and high speed image capturing Thermography, continuous ACU at traffic speed and a 100% coverage measurement tool. Although commercial off-the-shelf test equipment exists and is currently used in the highway community, there is a clear identified need for developing new advanced and automated nondestructive testing (NDT) tools – systems for evaluation of pavements and bridge decks. There is the importance of having the technology to provide approximately 100% of coverage. 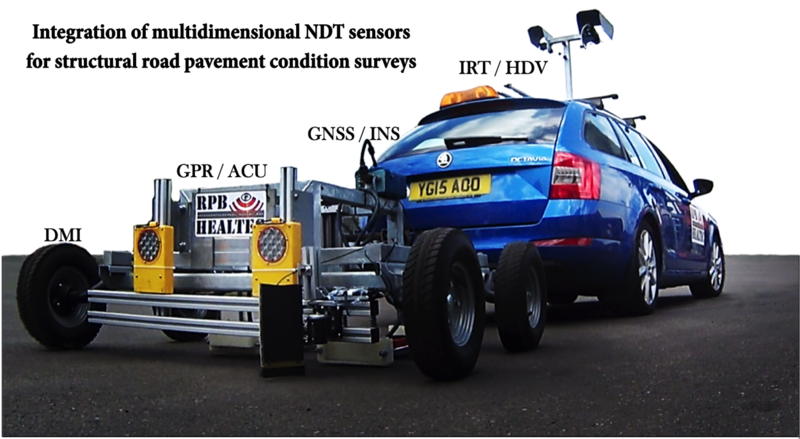 NDT assessment techniques such as Ground Penetrating Radar (GPR), IR Thermography (IRT) and Air Coupled Ultrasonic testing (ACU) have the ability to inspect effectively substantial areas, such as pavements and concrete. These NDT techniques will be used successfully in the detection of cracks, voids and other imperfections appearing either from the ageing of the materials or due to poor workmanship. IRT directly senses the infrared radiation that a material or structure emits and detects surface temperature differences. Investigation of pavements by the means of IRT is achievable, in view of the fact that subsurface defects in a material affect the heat flow through that material, triggering surface temperature differences. So, the method is ideal for measuring segregation in asphalt pavements. GPR provides information concerning the underlay structure of the examined pavements, layer thickness, as well as the depth and thickness of cracks, voids or other imperfections, such as moisture problems, appearing on the pavements. Furthermore, the use of ACU is mainly applied for sensitive inspections for defects such as voids, cracks and dis-bonds, for the identification of the thickness of pavements, the identification of complex modulus of elasticity of pavements, the non-destructive testing of bridge decks and the non-destructive testing of tunnels. Optimisation of maintenance procedures thus increasing the average life of a pavement and/or bridge deck. Improvements in the calculation methods that will be implemented for new pavement design and analysis. Reduction of at least 0.1% on future pavement construction and maintenance costs, translating to savings of EUR 60 million in the EU27 within the first six years after completion.